The beauty of obstacle course racing is that it gets you out of your everyday routine and lets you experience life. If you are stuck in a cubicle or trapped in an urban jungle—congested traffic and crowds are your daily obstacles. Running an obstacle course race gives you the chance to get back to nature—to roll in it, get dirty, and tap into your primal self so you can experience life—in the raw, unedited and real. 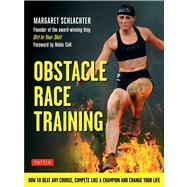 Margaret Schlachter, creator of Dirt In Your Skirt blog, is one the foremost competitors in obstacle course racing today. She put together this simple guide to make your obstacle race experience everything it's supposed to be—a test of your true self. She describes first-hand her personal training methods in learning to climb a rope, scale a wall, flip a tire, throw a spear, and carry a sandbag. More importantly, she provides guidance on how to get yourself mentally and spiritually prepared for the big day—and how to dig deep within yourself during a race to find the last ounce of strength to carry you across that finish line. Every weekend thousands of competitors run obstacle races all over the world. Winning or losing is secondary. More important for them is the ability to meet the physical and mental challenges and achieve personal success by completing the race. Obstacle Race Training is an invaluable resource that enables each and every competitor to experience the maximum level of success that they are capable of. Margaret Schlachter has been an obstacle course competitor since the birth of the sport in 2010 and is today the dominant female voice in this sport. She is a founding member of the Spartan Race's Chicked Movement, which is a campaign to get women involved in the sport. Schlachter works with the Spartan Race as a consultant, and is currently ranked 11th in the World for women and continues to climb up the rankings. In 2012, she became the first professional female obstacle course racer. She currently devotes all of her time to racing, writing and blogging at "Dirt in Your Skirt" website, helping inspire women to get off the couch and get active each day!